In the last issue of Vision we considered the thorny issue of Jerusalem’s future from the Jewish/Israeli point of view. Talking about the future in the Middle East inevitably brings up the past and the history of conquest and reconquest, particularly as concerns Jerusalem. Understanding the Palestinian position on the city requires consideration of all persuasions within the Muslim and Christian traditions of Arab/Palestinian life. 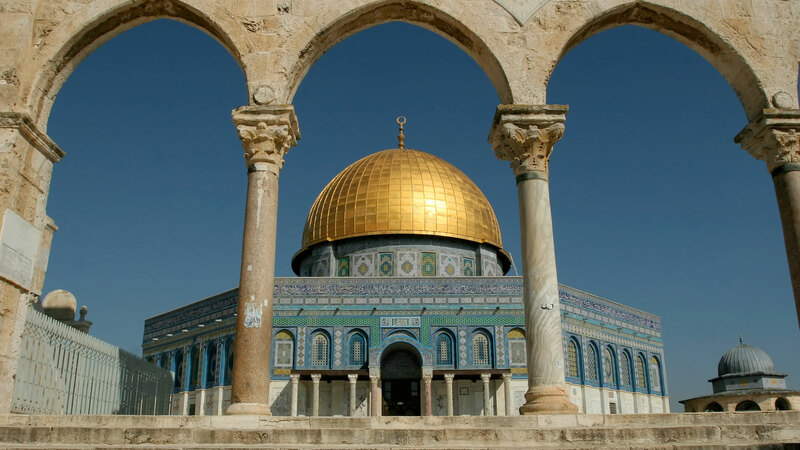 In Part Two in this series we focus primarily on the Muslim view of Jerusalem. The centrality of Jerusalem in Muslim Arab tradition begins at a very early point in the development of Islam. A verse in the Qur’an, specifying an incident in 620, concerns the Prophet Muhammad’s spiritual night journey from the Sanctuary Mosque at Mecca to what is referred to as the “remote” or “distant mosque,” al-Aqsa. This is thought to be an indirect reference to the City of the Holy House (the temple) or Jerusalem’s Noble Sanctuary, also known as al-Haram al-Sharif. According to the Qur’an, the angel Gabriel initiated Muhammad’s night journey to Jerusalem on the mystical winged horse al-Burak. On arrival, the horse was tethered in the southwest corner of the Haram close to what is today’s Western or Wailing Wall. Muhammad is then said to have ascended through seven heavens to God’s throne by climbing a ladder above the rock at the center of the temple platform built by King Herod in the first century B.C. The Prophet is further said to have experienced the Beatific Vision (direct knowledge of God) and to have returned home to Mecca before dawn. Jerusalem is also considered the first direction of prayer (qibla) established by Muhammad. For the first 18 months after fleeing from their enemies in Mecca, Muhammad and his followers prayed toward the temple in Jerusalem (Beit al-Maqdis) in reverence for its Jewish and Christian connections with God. But once the Jews and Christians of Muhammad’s acquaintance rejected him as the new prophet, his followers were required to pray toward Mecca. Nonetheless Jerusalem was still reckoned among Islam’s three holiest sites. A well-known Islamic hadith, or saying of the Prophet, instructs followers, “You shall only set out to three mosques, the Haram mosque [Mecca], my mosque [Medina], and the Aqsa mosque.” These three locations were considered of equal merit for prayer and pilgrimage. The relationship between Islam and Jerusalem was further cemented in 637/38 when the forces of Omar, the second caliph after the death of Muhammad, captured the city. Omar then traveled to Jerusalem from Syria, accepted its surrender, and signed a pact with the inhabitants assuring them of religious freedom. According to one account, when he arrived in the city, he sought out “the holy place,” meaning the Temple Mount. What he found was a desecrated and ruined place piled high with refuse. It had remained so throughout the entire Byzantine period. The Christians saw no religious value in the site of the Jewish temple, despising it so much that they used it as a dump. Omar and his Muslim troops were shocked by this disregard for the revered place and sought out the central rock where Abraham was believed to have attempted the sacrifice of his son in the ultimate act of submission to God’s will. Finding the location under a dunghill, they cleared the entire temple platform and cleansed the area with rose water. Omar is said to have marked out a niche for the direction of prayer, prayed to the south of the rock, and built a rudimentary mosque there. The central rock also became a focus of attention for the second founder of the Umayyad dynasty, Abd al-Malik (685–705), who built the Dome of the Rock, believing the rock to be the place from which Muhammad had made his ascent to heaven. It seems that Abd al-Malik and/or his son also built the original Aqsa mosque in 708–9 in the place where today’s reconstruction stands. In Muslim thought, Jerusalem replicates Mecca in certain ways. As with Mecca’s cubic shrine (the Ka‘bah), the rock is associated with Adam, the Garden of Eden, Abraham, the center of the world, and fertility. Through contact with Jewish and Christian thought, Muslim teaching assimilated certain ideas about future events and connected them with Jerusalem: the Resurrection and the Last Judgment would take place in the city, and the Mahdi (Savior) would come to the Haram. Perhaps this was why Muhammad’s friends are said to have requested that his body be taken there for burial. Palestinian scholar Sari Nuseibeh suggests that Muhammad understood Abraham to be the first disciple of Islam; that is, the first example of true submission to God. Muhammad’s reverence for Jerusalem and its spiritual heart, Mount Moriah (the rock where Abraham demonstrated complete submission, or islam, in attempting to sacrifice his son to God), was founded in his belief that Abraham was a representative of the true religion. According to Nuseibeh, for Muhammad there was but one faith, not three monotheistic systems. For the Prophet, he says, Judaism, Christianity and Islam were each simply manifestations of this primary religion in their own time. In the eighth century, earthquakes destroyed the Aqsa mosque twice. It was rebuilt and officially named al-Masjid al-Aqsa (the Remote Mosque) and associated with the Qur’anic allusion to Muhammad’s night journey. However, the first complete account of that unusual journey was not available until Muhammad ibn Ishaq’s biography, written about 100 years after the death of the Prophet. Jerusalem had by then become identified with Muhammad’s travel to the remote mosque, even though the building was not in place at the time of the mystical journey. As a result of other building projects, shrines multiplied within the walls of the Haram in the eighth and ninth centuries, several of them commemorating Jewish and Christian scriptural events. In 832 the Caliph al-Ma’mun ordered a restoration of the Dome of the Rock and minted coins on which Jerusalem became al-Quds, “the Holy,” the name used by Palestinians today. Around the year 1000, the Muslim scholar al-Wasiti published an anthology of well-known sayings in praise of Jerusalem. He attributed the following significant tradition to Muhammad: “Mecca is the city Allah exalted or sanctified, created and surrounded by angels a thousand years before creating anything else on earth. Then He joined it with Medina and united Medina to Jerusalem, and only a thousand years later created the [rest of the] world in a single act.” Such published sayings clearly demonstrate the importance of Jerusalem in Muslim tradition. By this time the Aqsa mosque had also become a seat of learning. A native of al-Quds, the geographer al-Muqaddasi (d. 1000), wrote that the city had “all manner of learned men” in his time. In Jerusalem in 1095 the Persian scholar and Sufi mystic al-Ghazali began his most famous work, The Revival of the Religious Sciences, at al-Aqsa. According to Arab scholar A.L. Tibawi, this work was to Islam what Thomas Aquinas’s Summa Theologiae would become to the Christian world. In response to requests from worshipers at the Aqsa mosque, al-Ghazali also wrote The Jerusalem Tract, a concise explanation of Muslim belief. “It was the dwelling-place of your father Abraham; the spot from which your blessed Prophet Muhammad mounted to heaven." Saladin also restored Jerusalem’s buildings and Islamic institutions of law and learning. Since its inception as a Muslim center, the city had attracted scholars and Sufi mystics. The Sufis had established themselves there at an early point and were encouraged by Saladin to return. It became clear, however, that al-Quds was not so important politically after its rulers located themselves in Syria and Egypt following Saladin’s death in 1193. In 1260 the Ayyubids in Palestine gave way to the Mamluk dynasty. Ruling the territory for 250 years, the mostly Turkish Mamluk sultans brought stability after the chaos of the Crusader period. Jerusalem, however, was once more isolated from the center of administrative power in Syria. It became a gathering place for exiled Mamluk leaders, scholars and wealthy patrons of the religious sites. Christians and Jews were allowed rights in the city, and major renovation and new construction were extensive during the period. The Ottoman Turks defeated their Mamluk relatives, conquering Jerusalem in 1516. Sultan Selim I visited the city immediately and received the keys to the Aqsa mosque and the Dome of the Rock. He and his son Suleiman venerated Jerusalem and resumed the building programs of the Ayyubids, restoring the Dome of the Rock and rebuilding the city walls after 300 years of ruin and disrepair. The present-day walls of Old Jerusalem date from that rebuilding effort. As Ottoman central control diminished over the course of the next 200 years, local notable families in Jerusalem rose to power in religious and social leadership roles. In the 18th century these notables gained sufficiently in strength and ability to represent the people to the Turkish authorities in Istanbul and to maintain the status quo on behalf of the Ottomans. It was in 19th-century Jerusalem that the outlines of the present debate over the city began to take on a more familiar form. The Ottomans promoted the special status of Jerusalem, and as the city developed into the administrative capital of Ottoman Palestine, the contours of the future political entity began to be apparent. But the growing weakness of the empire led in 1832 to the capture of Syria and Jerusalem by Ibrahim Pasha. The new ruler encouraged openness toward the European powers, which one by one established consulates in the city, ostensibly to protect the religious interests of their citizens. The British consulate was the first to open its doors. In 1840 Ibrahim Pasha was expelled from Syria, and Jerusalem became the subject of internationalization for the first time. A Christian administration under European control was proposed for the city, but the returning Ottomans did nothing to bring it about. Even though they were back in control, however, they did not change Ibrahim Pasha’s policy of religious toleration. The Ottomans eventually established a limited democracy in the region, with Jerusalem represented as a city and district in Istanbul’s Ottoman Parliament of 1877–78. The effect in Jerusalem was that members of local notable families became eligible for central and local government office, and Jerusalem grew in political importance. Jerusalem was a significant element in the development of Palestinian identity in terms of the construction of a modern national consciousness. In 1882 the British established themselves as colonial power in Egypt, and the first pre-Zionist immigrants arrived in Palestine. These two developments set the scene for the next phase in the significance of Jerusalem in Arab and Palestinian thought, as the concept of a separate Palestinian Arab identity began to take shape. According to Palestinian scholar Rashid Khalidi, Jerusalem was a significant element in the development of Palestinian identity in terms of the construction of a modern national consciousness. He mentions that around the turn of the 20th century, parochial loyalties “served as the bedrock for an attachment to place, a love of country, and a local patriotism that were crucial elements in the construction of nation-state nationalism.” Attachment to Jerusalem is a powerful example of such parochial loyalty. On November 2, 1917, the British government issued the Balfour Declaration in support of a national home in Palestine for the Jewish people. Just over one month later on December 11, following the sudden retreat of Ottoman and German forces from Jerusalem, General Edmund Allenby, the British commander-in-chief, entered the Old City. Thus ended more than 1,200 years of Arab and Turkish Muslim rule, broken only by the short Crusader period. Events in the history of the Arab-Zionist conflict, which has lasted until today, have often centered on Jerusalem. In 1922 the League of Nations established the British government as the mandatory authority in Palestine, and Jerusalem became the capital. During the course of Israel’s War of Independence shortly after World War II, the city was at the eye of the storm. West Jerusalem fell to the Zionists, and hundreds of thousands of Palestinians fled or were driven from their homes across Palestine. For the dispossessed it was Al-Nakba (The Catastrophe) from which they have never recovered. Jordanian forces retained the Old City, which was separated from West Jerusalem by no-man’s-land. For the next 19 years East Jerusalem was marginalized, begrudgingly allowed to be Jordan’s second, though underdeveloped, capital. The Israeli capture of the eastern part of the city in the 1967 Arab-Israeli War was the start of today’s continuing problems. The building and expansion of Israeli settlements, the disruption of Palestinian life, the severing of links between the Palestinian north and south West Bank, the construction of the infamous security fence through East Jerusalem—all these developments have made the city the exceedingly troubled place it is. At the center of the dispute lies the Haram/Temple Mount—the lodestone of Palestinian and Israeli identity. The PLO’s official Web site states that East Jerusalem, including the Old City, is part of the territory over which the Palestinian State will exercise authority once the state is established. It will be the capital. Further it notes that the Declaration of Principles on Interim Self-Government (Oslo Agreement) specifies that all of Jerusalem, East and West, is open for permanent-status negotiations. Thus Jerusalem should be an open city, with no physical partition. The PLO promises that since most of the holy sites are in East Jerusalem, including those in the Old City, the State of Palestine will guarantee freedom of worship and access. While identifying irrevocably with East Jerusalem, the PLO has taken a more measured view of the city’s final negotiated settlement than has its troublesome rival, the Muslim fundamentalist organization Hamas. The charter of Gaza-based Hamas makes reference to Jerusalem in the context of the Muslim history of Palestine. It draws attention to the “ideological invasion” of Muslim lands once the Crusaders had defeated Saladin. In Hamas’s view, “orientalists and missionaries” brought about the invasion. In an interview at his Gaza home in February 1998, Hamas’s spiritual leader Sheikh Ahmad Yassin indicated the impossibility of compromise over Jerusalem. He told the Israeli reporter that peace could be achieved only once all the land is returned to the Palestinian people and an independent state called Palestine is established, with Jerusalem as its capital. “In the shade of Islam it is possible for the followers of the three religions, Islam, Christianity, and Judaism, to live in peace and harmony. This peace and harmony only is possible under Islam, and the history of the past and present is the best written witness of that. The Muslim Palestinian perspective on Jerusalem is embedded in the city’s rich history, as is the Jewish/Zionist/Israeli perspective. The resolution to the complexity imposed on the situation rests with the parties who must engage in constructive dialogue. How that might be achieved will be covered in the next issue of Vision.